I just got back from India and am ready to head to downtown Toronto on Monday to start an internship with CBC radio. As I sort through the photos and mentally process the trip, I thought I might share some of the lessons gleamed from my experiences. Engrish.com is one of my favourite websites. It features the hilarious and often profane spelling mistakes found in public displays of the English language (mostly in China). In India, where English is one of 2 official languages (22 others have official status in different states), the mistakes are rarely as hilarious, but they are plentiful. I would guess that about half of all signs, posters, and marquees contain at least one gaffe. Spell check, it seems, is a luxuary. LESSON 2 – PUBLIC TOILETS VARY IN QUALITY: Often they’re just a hole, a tap, and a bucket. Side note: Bring your own TP. Second side note: Men, fear not, the entire country is your urinal (confirmed sightings of public micturition – 47). LESSON 3 – WHITE = MINOR CELEBRITY STATUS: I’ve traveled a bit over the years and have occasionally noticed people staring or smiling at me. A tourist is often something of a strangely dressed novelty, but in India, people would shake my hand at random, little kids would say, “Hi uncle! What’s your name?,” and complete strangers would approach me to pose in their snapshots (being extremely photogenic, I happily obliged). I don’t know if anyone has informed the Disney corporation’s dark legion of litigators, but the likeness of Mickey Mouse is found everywhere in India (including toys, fireworks, and walls of domestic airports). I was tempted by a pair of genuine “Versage” boots, official government stores sold counterfeit cologne, and I longed for some of the Lt. Col’s GFC (8 secret spices). 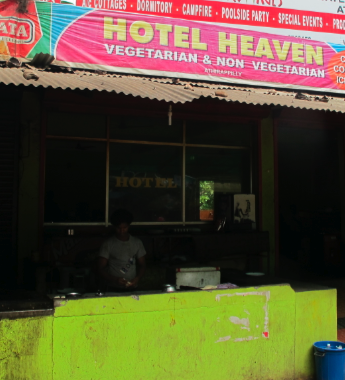 LESSON 5 – A HOTEL IS NOT A HOTEL (EXCEPT WHEN IT IS): Some of the most baffling signage in India comes courtesy of the astronomical number of hotels – the majority of which are restaurants with nary a bed or bellhop to be found. A fellow traveler who grew up there said the reason for “hotel” (pronounced ‘hot-el’ rather than ‘ho-tell’) is that it’s easier to spell than restaurant. Plus it sounds luxuarious. Here’s a tip for telling the difference: Your local Holiday Inn or Ramada rarely specifies vegetarian or non vegetarian.